The gas arrives in the early morning. Forty tons of liquified natural gas is pumped on board the Viking Grace in the Swedish capital while sleepy foot passengers embark and lorry drivers park up for the long journey ahead. 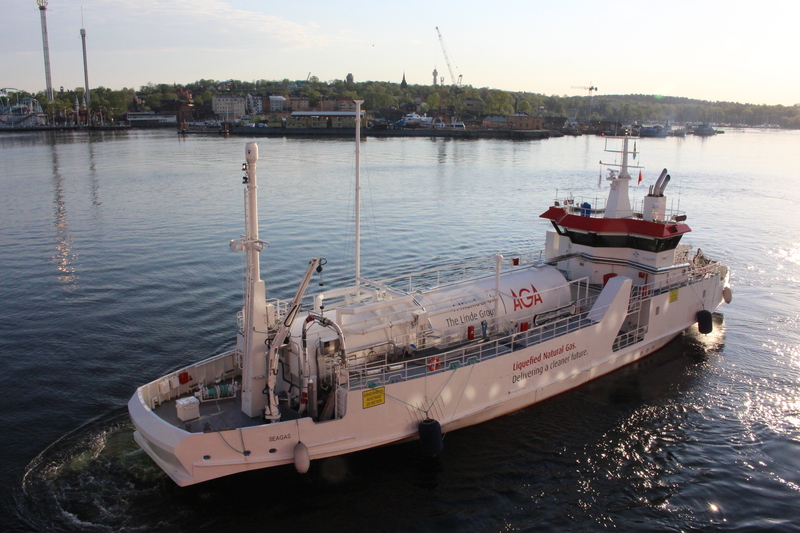 This is the first ferry to be powered by LNG, sailing through the beautiful archipelagos of southern Sweden and Finland between Stockholm and Turku at up to 25 knots. Icy LNG comes on board from the small tanker SeaGas (pictured) as a pressurised liquid but soon expands back into a gas and is stored in giant tanks at the stern. “It’s a clean fuel,” said Chief Engineer Peter Borenius in his spotless control room where CCTV and computer screen give him a comprehensive view of the four Wärtsila engines and everything else technical. He’s been involved with the ship since her arrival in Baltic waters almost three years ago and is an enthusiast for the technology. Indeed, he is frequently asked to host tours to explain the system to people from other shipping companies. If the weather is kind, this is one of the most exquisite ferry journeys in the world. For 11 hours, the Grace picks her way through narrow channels past thousands of islands, some inhabited, some with a few trees and ancient lights; there is very little open sea at these latitudes. The shop docks at Mariehamn, capital of Åland, and some passengers transfer to another ship for the return voyage. A rapid turnaround at Turku, beneath the medieval castle and off again through the archipelago, customers enjoying dinner as the sun sets. It is a magnificent sight.